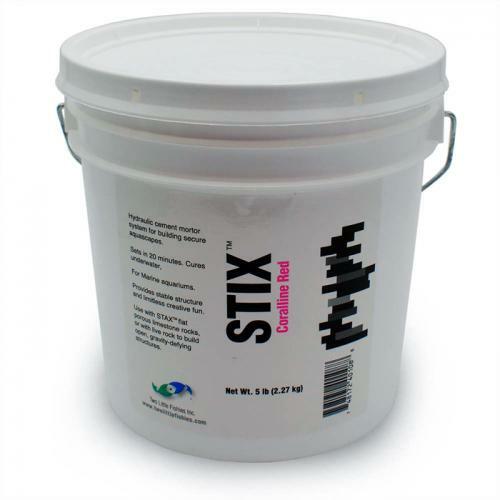 Brief Description: STIX is a fast setting coralllne red coloured mortar system designed for aquascaping freshwater, marine and reef aquariums. The kit includes the dry cement, liquid polymer admixture, and a spatula to assist you with mixing in the bucket. Notify me when "Two Little Fishies STIX Coralline Red Aquascaping Cement [5 lbs]" is re-stocked. Provides stable structure and limitless creative fun. Use with STAX for a perfect aquascaping solution. Add approximately 12 oz of tap water to the pouch of liquid polymer concentrate to dilute it. Seal pouch and shake well. This kit contains more liquid polymer then is than is needed to mix with the dry mortar. Apply a small amount of the diluted liquid to the rock surface before bonding for a stronger joint.